I love to taste-test new recipes, particularly ones that hail from culinary cultures other than my own, so today’s post from Leslie at From Playdates to Parties is right up my alley! Her recipe for a simple, easy Huminta sounds absolutely delicious. What is Huminta, you ask? 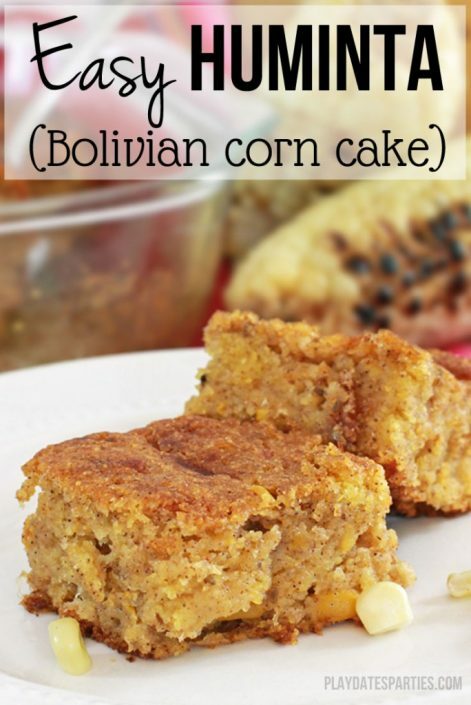 Well, I didn’t know either, but after reading Leslie’s recipe, I’m really looking forward to adding this Bolivian corn cake to my arsenal. It is choc full of spices and just sounds so much more interesting than your run-of-the-mill corn bread or cake. What’s your favourite zoo animal and why? Definitely the giraffe. Aside from just being so curious to look at, they’re so quiet and calm. With three kids under 10, any quiet moment is cherished. Go ahead and spend the $4 on a new box instead of making Samoas from Scratch. Thank you so much for sharing this recipe today Sarah! I always look forward to having Huminta at family get-togethers and hope you enjoy it too!